In all my years providing leadership succession and ownership transition planning and financial advisory services, I have seen CEOs do plenty of smart things and plenty of not-so-smart things. But one of the smarter moves I’ve seen was Bill Hadge, during the interview process for the position of CEO of GZA GeoEnvironmental, proposing to the firm that he would step down as CEO six years later, completely leaving the company to a new leader. Now whether it be six, eight, or even ten years, “term limits for CEOs” has long been a hotly debated topic, with strong arguments for and against [hyperlinks below]. There’s sometimes a fear that CEOs can become “lame ducks” for the period of time between when they announce their resignation, and when they leave – but there are also examples of imminently retiring CEOs being freed to make the tough decisions that set their successors up for success. Based in Norwood, Massachusetts, GZA is a multi-disciplinary consulting firm providing environmental, geotechnical, ecological, water, and construction management services. It employs more than 650 people in close to 30 offices in New England, the Mid-Atlantic, and Great Lakes states, and has provided critical engineering support for projects like the new Tappan Zee Bridge in New York and the $2 billion Encore Boston Harbor resort casino in Boston. Like many professional services firms in engineering, architecture, and environmental consulting, GZA has a tradition of electing a CEO from among the ranks of its top principals. 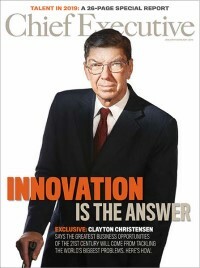 For 54 years, this practice has created continuity and nurtured a uniquely strong corporate culture of innovation and collegiality. By any measure, Bill’s almost six years as CEO have been highly successful: GZA has completed 7 acquisitions that have helped increase its employee base by 35 percent and substantially strengthened the company’s business in the Great Lakes and Mid-Atlantic. GZA’s corporate tagline (“Known for excellence. Built on trust.”) has been demonstrated by a steady string of awards. 1) The first thing that Bill did right when he set a single six-year term for himself was: He picked the right number. It’s a long enough term that he gave himself enough runway to get some major initiatives strategized and implemented. It’s also a long enough term in power to discourage most anyone determined to wait him out and bide their time until a new CEO with a different vision and style appeared. At the same time, setting a six-year term also sent a highly positive signal to the next generation: If you think of yourself as future CEO material, in just a little over five years, you’re going to get a chance to put yourself up for consideration. Making that five-year wait all the more palatable: Bill’s declaration that once his term was up, he planned to leave GZA and not be a looming, potentially second-guessing figure over his successor’s shoulder. 2) Unlike other forms of succession planning that tend to emphasize only candidates’ positive characteristics, Bill’s approach encouraged members of the CEO Selection team to think differently by openly discussing weaknesses and negatives. Compared to 10 or 20 years ago, getting people to offer candid, sometimes critical feedback about colleagues’ shortcomings has become a major challenge for all kinds of organizations. The Selection team also pushed successor CEO candidates to be fully honest about their weaknesses and shortcomings. Moreover, they had to think about how they might seek coaching to improve in those areas or consciously delegate some functions to other senior executives who could fulfill them more effectively. “If they can’t take our tough questions, they shouldn’t be CEO,” Bill assured his team more than once. 3) This process culminated with a significant moment with respect to the future of the firm when the initial pool had been pared to a shortlist, two of the top candidates for CEO jointly came to the committee and both said: Our respect and appreciation for each other is such that, if you pick one of us to be the next CEO, the other will be fully supportive of the decision and will do everything he can to move the company forward with the new CEO. This subordination of ego and ambition to the overall company good is something you’d rarely see at most Fortune 100 companies, investment banks, or other competitive corporate hothouses. It struck me, however, as a logical outcome of a corporate culture in which the CEO had made clear from day one that the company would always be bigger than the CEO’s ambition or pride. The tone that had been set from the top was, the CEO is there as much to serve as to lead, and to engage and inspire the next generation of leadership. David Cohen is Managing Director and Shareholder of Matheson Financial Advisors Inc., providing financial management, business valuation, ownership transition and succession planning, and mergers and acquisition advisory services to Architecture, Engineering, Environmental Consulting, and Construction firms.